The Church of the Three Crosses in Vuoksenniska is one of Imatra’s parish churches. 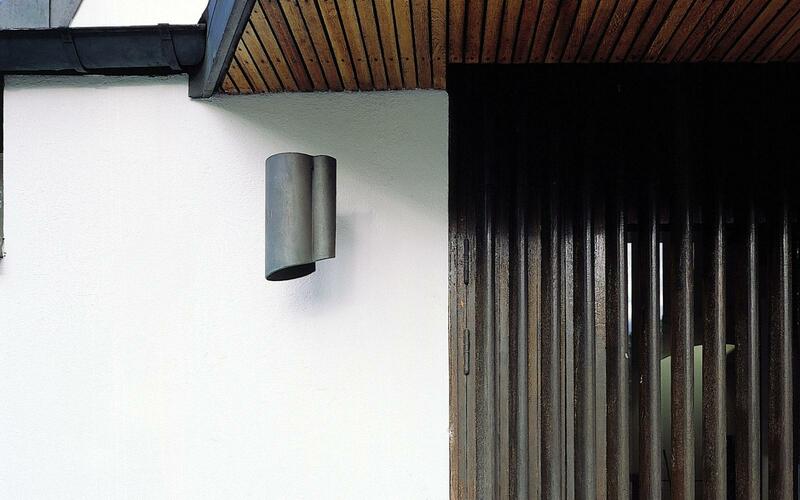 After the Second World War, Alvar Aalto was commissioned to create a master plan for Imatra, which merged three of the rural municipality’s widely separated old villages: Imatrankoski, Vuoksenniska and Tainionkoski. 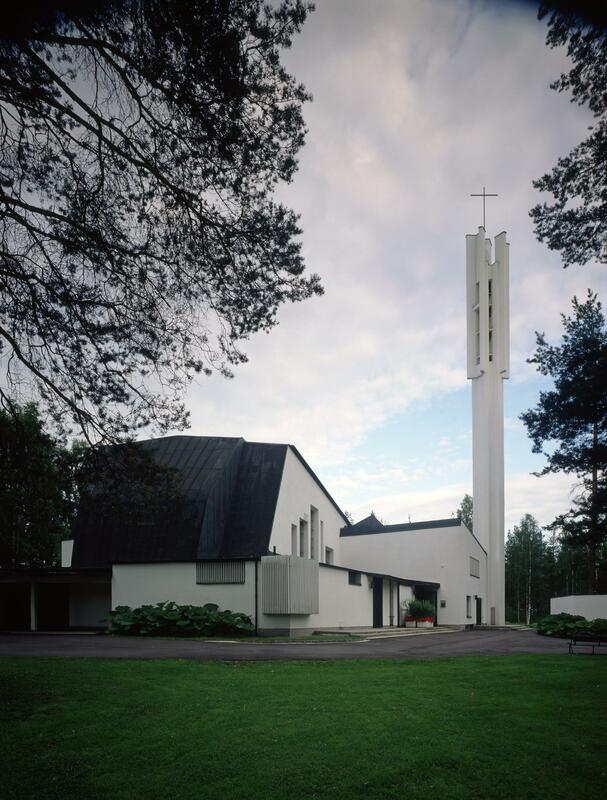 The industrial community also required church amenities, and thus Aalto was commissioned in 1955 to design a new church. 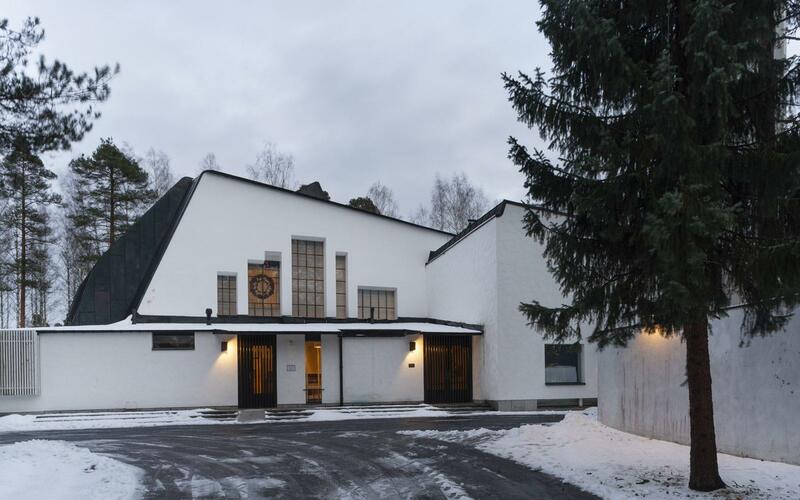 Aalto designed the church for the Vuoksenniska industrial community so as to combine sacral and social activities. The church was completed in 1958 on the high, pine-forested ridge that divides Lake Saimaa from Lake Immala. 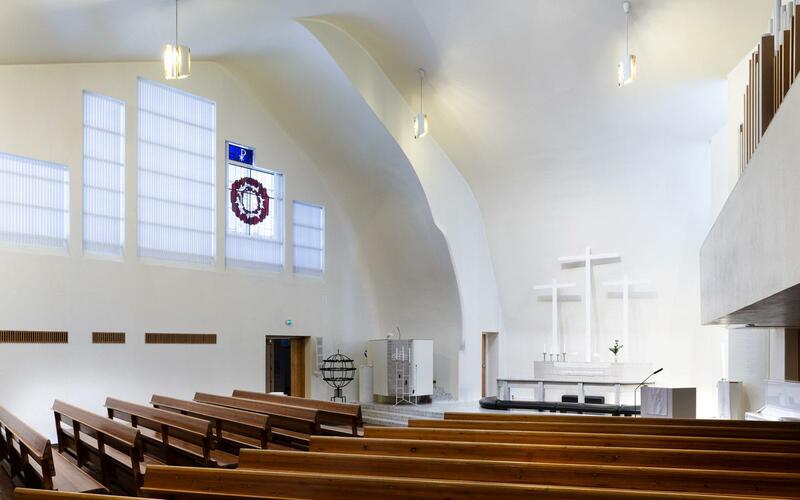 Alvar Aalto, together with his office collaborators, designed the church interior, complete with its lamps, church collection baskets and candle holders, in the spirit of a total work of art, or “Gesamtkunstwerk”. The basic design of the sculptural white church consists of a series of consecutive sections. The main church space can be subdivided into three spaces using movable partition walls; the most sacred of which is the altar end and its pews, and the organ and choir balcony. Opposite this, at the southern end of the building, one could play volleyball or badminton without disturbing the other activities, the architectural complex or the sacral nature of the church. For the everyday parish activities, a kitchen and meeting room were built in the basement. The church complex also comprises a 34-metre high sculptural concrete campanile, as well as a vicarage that encloses the southern courtyard. Aalto worked on the design of sacral buildings throughout his career, but several of his church designs never went beyond competition proposals. Of his realised churches, the Church of the Three Crosses completed in 1958 in Vuoksenniska is unique. The small sculptural parish church, rising up amidst pine heath, embodies the free and imaginative aspect of Aalto’s architecture. 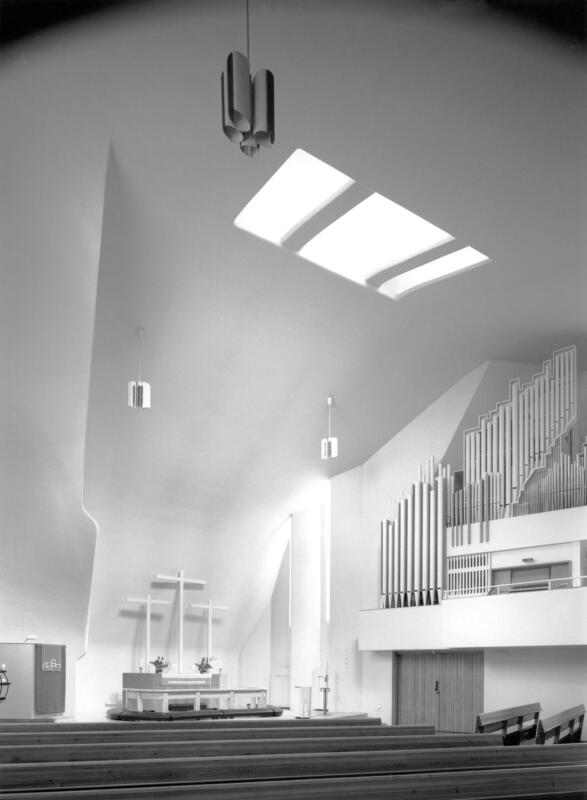 The church can be said to be Aalto’s response to the development of modern church architecture in central Europe. The Church of the Three Crosses in Vuoksenniska is unique. The small sculptural parish church, rising up amidst pine heath, embodies the free and imaginative aspect of Alvar Aalto's architecture. Imatra is located approximately 260 kilometres away from Helsinki. You can reach Imatra by a train or a bus. The station is located on Koskikatu 1, 55120 Imatra. City of Imatra also has a good public transport system. Local taxi-service you can reach by calling +358 200 60 400. The church is open for visitors during the winter season only during weekends from 9 am to 4 pm. During the summer season, the church is open from Wednesday to Sunday from 9 am to 4 pm. Please confirm opening times prior to your visit from Parish of Imatra! Please note that you can purchase publications about Church of the Three Crosses as well as download architectural drawings from Alvar Aalto web shop!